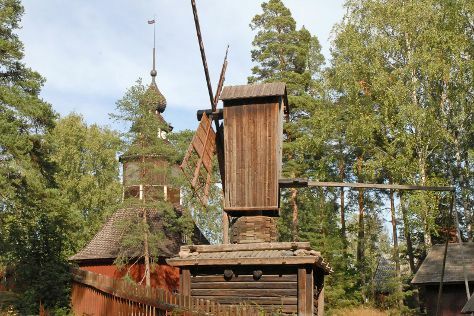 You'll explore and learn at Seurasaari Island and Open-Air Museum and Natural History Museum (Luonnontieteellinen Museo). You'll discover tucked-away gems like Katajanokka and Sipoonkorven Kansallispuisto. Explore the numerous day-trip ideas around Helsinki: Espoo (Nuuksio National Park & Arctic Expedition) and Porvoo (Cathedral of Porvoo & Porvoo Old Town). The adventure continues: explore the world behind art at Kansallisgalleria, explore the different monuments and memorials at Hietaniemi Cemetery, wander the streets of Ullanlinna, and play a few rounds at Tapiola Golf. To see photos, other places to visit, maps, and tourist information, read our Helsinki trip builder tool . Springfield, USA to Helsinki is an approximately 20-hour flight. Due to the time zone difference, you'll lose 8 hours traveling from Springfield to Helsinki. Expect much colder weather when traveling from Springfield in June: highs in Helsinki hover around 65°F, while lows dip to 50°F. You'll have a few hours on the 15th (Sat) to wrap things up before traveling home.